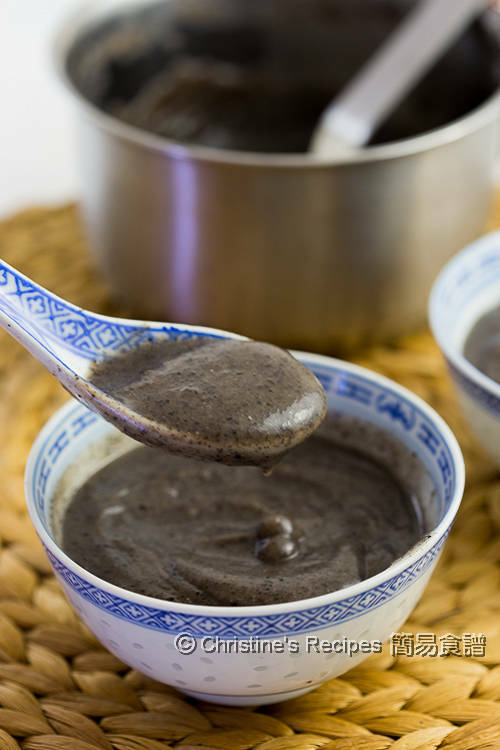 Black sesame soup (芝麻糊) is a traditional Chinese dessert. Some dim sum restaurants still have this dish on their menu. It’s mainly made of black sesame seeds, rice, water and sugar. Black sesame seeds are rich in vitamin B and iron, together with many other health benefits, protecting heart health, nourishing hair and facilitating bowel movements. When I was small, I was quite reluctant to try foods in black colour. My dad intrigued me to try black sesame soup and said it’ll help me sustain healthy and beautiful skin. Having tried once, I felt in love with this dessert for the whole life. 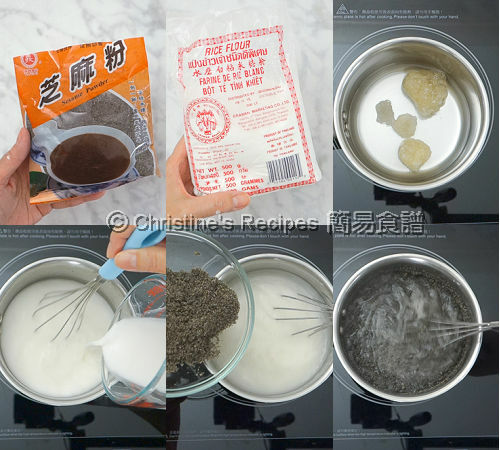 The traditional way of making black sesame soup is not quite straight forward and challenges your patience. The whole process takes a long time and effort. I love eating black sesame soup, but also love short-cut cooking methods to achieve similar results. This recipe was a cheater's version. You don’t need to grind the black sesame seeds at all. Top left: black sesame powder. Top middle: rice flour. Top right: rock sugar and water. All you need is to get a quality product of black sesame powder. 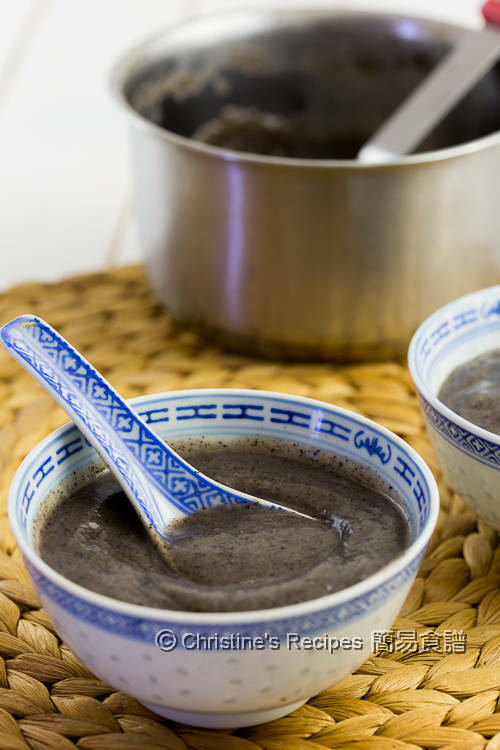 A bowl of fragrant and delicious black sesame soup can be served within 30 minutes. Are you intrigued too? Put 1½ cups of water and rock sugar in a sauce pan. Cook over medium heat until the sugar is dissolved. In the meantime, mix 1 cup of water with the rice flour. Mix well. Stir in the rice flour mixture into the syrup. Stir consistently until thickened. Quickly stir in the black sesame powder. Combine well. Serve immediately. The smoothness of this dessert soup largely depends on the black sesame powder you used. The finer the powder you use, the smoother the dessert you’ll get. This time I tried a product got from a nearby Asian grocer. I was quite satisfied with the results. You might like to try Amazon instead. They don’t have the brand I used. Here’s another brand of pure black sesame powder without any sugar. If the dessert soup is cooled down, it becomes thicker. You may add some hot water to loosen it up again. Cool! I always love black sesame soup and now I have an easier version to try. Thanks, Christine. Thanks Christine! One of my childhood favorites plus I love to add mocha balls. Does it required rice flour or can sweet rice flour be substituted? I've mochi, glutinous rice ball recipe on this blog. Feel free to try it out. I just made this and it was delicious!! If itsi a little too much to finish, am I able to fridge it or freeze it to eat later? Or should I just half the recipe to make a smaller portion? Thank you so much for this delcious recipe! Glad that you liked this recipe. Yes, a bit too much. :p The leftover can be stored in fridge or freezer for later use. You might need to add some water to adjust the consistency when reheat. Sure, you can decrease all the ingredients by half next time. First of, the recipe sounds really tasty, and I'd love to try it out. I was wondering whether different types of sugar could be used instead of rock sugar, considering that the size and density would only influence the time needed for it to completely dissolve into the water. Or does the rock sugar have a different property (taste wise) that the usage of another sugar, such as for example basic white granulated sugar, could not provide? I'm asking because rock sugar is not widely available where I'm from. Would love to hear your thoughts! I often use the Chinese yellow rock sugar to make Chinese desserts. It's made from unprocessed sugar cane, so it'll bring a depth of flavours. It tastes not as sweet as regular white granulated sugar. You can easily find it in any Asian grocers. If it's not handy to you, I suggest you try raw sugar. Regular white granulated sugar doesn't provide you with the rich taste as rock sugar or raw sugar does. But I don't think it's wrong if you use white granulated sugar. But the sesame powder isn't toasted? Does it still taste good? What is 35gm and 30gm? Does it work with black tahini instead of powder? If so, what is the quantity ratio? Sorry, I haven't tested this recipe with black tahini. I don't have any record and can't tell what the end result is like. Feel free to experiment. If you do so, please let me know how it goes. Can I use sesame paste? I didn't try sesame paste. Sorry I can't tell.